At Mitchell Dental Spa, we devote a large portion of our practice to general dentistry services geared toward preserving oral health and avoiding severe dental complications. When it comes to oral health, tooth loss is literally the “worst-case scenario,” and one that patients should try to avoid at all costs. Unfortunately, tooth loss is a dental complication that is experienced by many patients each year. The loss of a natural tooth can affect the structure of the mouth, compromise oral functions, and detract from the beauty of the smile. For all of these reasons, it is important to address tooth loss right away. A dental bridge is one of the most effective restorative treatments for tooth loss. Here, we discuss the typical dental bridge procedure at our Chicago, IL practice, as well as how this treatment can benefit our patients. A dental bridge is a restoration that bridges the gap that is left behind when a patient experiences tooth loss. This restoration is comprised of two dental crowns (the anchors that secure the dental bridge on either end) and the prosthetic tooth or teeth, called the pontic, which is fabricated to replicate the tooth or teeth that have been lost. A dental bridge is one of the most common treatments for tooth loss, and can restore the strength, structure, and beauty of patients’ smiles. The dental bridge treatment procedure is usually split into two dental appointments. At the initial appointment, Dr. Mitchell will prepare the natural teeth adjacent to the missing teeth. These teeth will be reshaped to accommodate the dental crowns that will be placed over them. 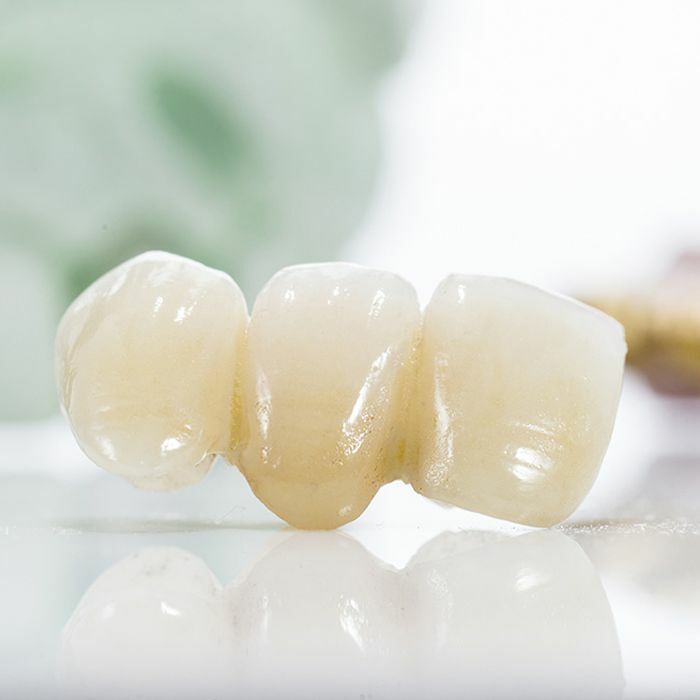 Once the adjacent teeth have been reshaped, impressions of the teeth will be taken, and will be used to design the two crowns and pontic that will make up the dental bridge. After the dental bridge has been fabricated, patients will return for the placement of the restoration. The crowns will be bonded to the two adjacent teeth, and the pontic piece will sit over the gum line to fill in the gap of space that have been left by tooth loss. Dr. Mitchell will always test the fit of the dental bridge before permanently bonding the piece into place. If there are any necessary adjustments, they can be made before the bridge has been secured. Once the dental bridge has been bonded into place, the prosthetic should feel similar to the natural teeth. A dental bridge addresses tooth loss so that patients can restore the strength and function of the teeth while also avoiding many of the risks associated with tooth loss. In addition, a dental bridge can enhance the beauty of the smile by addressing unwanted gaps in the smile. Overall, a dental bridge is an effective way to treat tooth loss and preserve the health of the remaining natural teeth. If you have suffered from tooth loss, there are several restorative dentistry treatments that are available to help you rebuild your smile. If you have questions about dental bridge treatment, or would like to learn more about our other treatments for missing teeth, contact Mitchell Dental Spa at your earliest convenience.